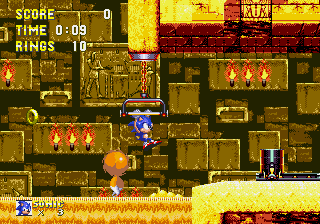 Sandopolis Zone is the third zone in Sonic & Knuckles (the ninth zone in Sonic 3 & Knuckles) and is separated into two parts: a sandswept, quicksand-filled desert for Act 1, leading to a giant, labyrinthine pyramid for Act 2. The latter one is well known for featuring ghost enemies. Sandopolis Zone is a fairly long level, taking on a more platform-based, puzzle-oriented style than most levels before it. 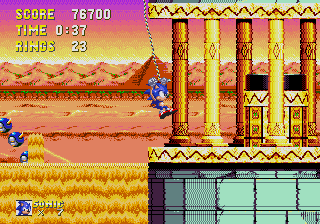 Puzzle navigation is crucial in Act 1, as Sonic and Knuckles have to move blocks out of their path and bungee-jump down long ravines to progress. The torches in the background of Act 2 are not just for decoration; they serve as actual illumination for the level and will progressively get dimmer until a light switch is pulled. The light has 4 stages: bright, semi-bright, dim and dark. The player (unintentionally) meets the Hyudoro by falling on an animal prison in Sonic's story and they then attempt to thwart the player's travels the rest of the level. The Hyoduro are likewise affected by the light; as the lights get darker the ghosts get more powerful and aggressive. They are at their most powerful when the lights go out, and at that point can physically hurt Sonic or Knuckles. If Act 2 is being navigated by Knuckles, the Hyudoro have already been freed prior to Knuckles' arrival (possibly due to Knuckles' story taking place right after Sonic's, or, out-of-universe, Knuckles' ability to avoid it otherwise) and will immediately attack him upon the start of the level, as it is dark. The zone is entered by Sonic or Knuckles falling from the sky into the sand at the beginning of the first act, and is exited by Sonic falling into some kind of hole in the ground, or by Knuckles just walking over it (both ways lead to Lava Reef Zone). Skorp - Scorpion badniks that whip out their stingers. Sandworm - Caterpillar bots that dig in the sand. Hyudoro - Ghost enemies inside the pyramids. Rock'n - Robots Guarded by sand blocks. This page was last edited on 22 December 2018, at 22:42.